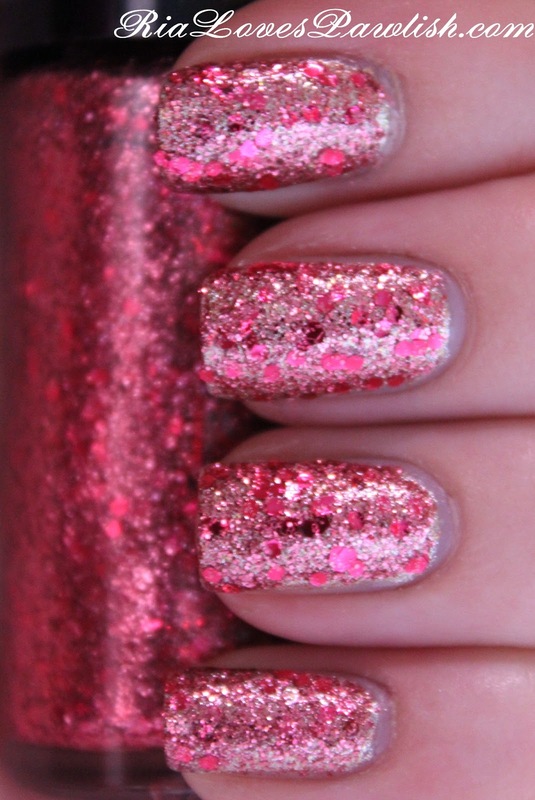 today's polish is Hard Candy Glamour Girl from their Glitteratzi collection. since it's fairly sheer, i layered it over Hard Candy Crush On Gold. Glamour Girl is a warm, saturated pink glitter with large hex pieces and micro-glitter in a clear base. i love how gold and pink look together, this combo is just beautiful. i used one coat for this look, with minimal placing needed for evenness! it's a bit rough, so i would add a topcoat, which has the added bonus of bringing out all the shinies. if you don't like feeling any texture on your nails, you will probably need multiple coats of topcoat! one coat Glamour Girl, one coat Seche Vite, both over Hard Candy Crush On Gold. i love it when really simple polishes make amazing combos :D let me know what you think when you get it!